This recipe comes from a man who worked in a Chicago pizza shop, and it is the best pizza recipe ever! If you don't have a bread machine, just put the ingredients in a food processor and mix it up until it forms a dough ball. I love this recipe because you don't have to let the dough rise, making it fast and easy. In bread machine pan, place the first eight ingredients in order suggested by manufacturer. Select dough setting (check dough after 5 minutes of mixing; add 1 to 2 tablespoons of water or flour if needed). When cycle is completed, turn dough onto a lightly floured surface. Roll into a 14-in. circle. Sprinkle a greased 14-in. 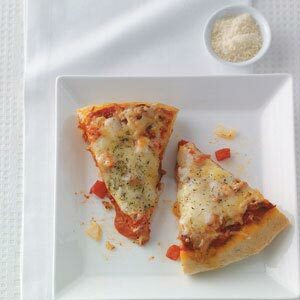 pizza pan with cornmeal. Transfer dough to prepared pan. Combine spaghetti sauce and sugar if desired; spread over dough. Top with the pepperoni, tomatoes, onion, cheeses and Italian seasoning. Sprinkle California garlic over pizza. Bake at 400° for 30-35 minutes or until crust is lightly browned. Let stand for 10 minutes before cutting. Yield: 8 slices.